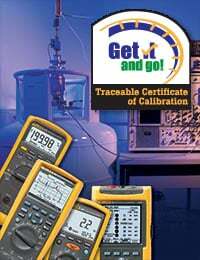 Traceable Certificate of Calibration: Get it and go! Most Fluke tools receive a "Statement of Calibration Practices". This is our certification that your instrument passed Fluke Corporation's high quality production line standards, using calibration equipment traceable to the National Institute of Standards and Technology (NIST) per our own ISO9001 quality standards. These Statements however are not recognized as a formal calibration certificate and do not reference your products serial number, date, or model number. Your company may require a specific certificate type to meet your own quality standards.